We’d love your help. Let us know what’s wrong with this preview of Making Your Own Days by Kenneth Koch. From one of the most esteemed American poets of the twenty-first century comes a celebration of poetry and an invitation for anyone to experience its beauty and wonder. Full of fresh and exciting insights, Making Your Own Days illuminates the somewhat mysterious subject of poetry for those who read it and for those who write it—as well as for those who would like to read an From one of the most esteemed American poets of the twenty-first century comes a celebration of poetry and an invitation for anyone to experience its beauty and wonder. Full of fresh and exciting insights, Making Your Own Days illuminates the somewhat mysterious subject of poetry for those who read it and for those who write it—as well as for those who would like to read and write it better. By treating poetry not as a special use of language but as a distinct language—unlike the one used in prose and conversation—Koch clarifies the nature of poetic inspiration, how poems are written and revised, and what happens to the heart and mind while reading a poem. To ask other readers questions about Making Your Own Days, please sign up. Kenneth Koch is one of my favorite poets. His poems are wild, funny, full of heart and mud. For me, he's the voice of the New York School par excellence. It's his writing which brought us Dean Young. But this book has almost none of his fire or originality. Partially, the issue is that I was expecting something slightly different---this is a book for BEGINNING poets. I'm not saying that in a haughty way. I still have a ton of things highlighted, and I am ready to learn from anyone or anything. B Kenneth Koch is one of my favorite poets. His poems are wild, funny, full of heart and mud. For me, he's the voice of the New York School par excellence. It's his writing which brought us Dean Young. But this book has almost none of his fire or originality. Partially, the issue is that I was expecting something slightly different---this is a book for BEGINNING poets. I'm not saying that in a haughty way. I still have a ton of things highlighted, and I am ready to learn from anyone or anything. But Koch's intention here is to inspire/instruct new poets with and about the fundamental tools of the game. His sample poems almost all either Romantics or Shakespeare. They're great. But that's not why one reads Koch. With regard to "the basics" issue--certainly, I'm always up for learning some new technique or philosophy on line breaks for instance. But Koch focuses here on the FACT of line breaks...the purpose for them...the different types. In truth, I've long been mystified/frustrated/put off by poetry. But over the years, an urge to understand, or at least better appreciate, what all the fuss has been about these last 3000 years has tugged at me. My only formal experiences of poetry study were in high school (in the appreciation mode) and college (1 course, in the academic mode). The former came at too early a point in my aesthetic/intellectual development, and made no greater impression on me than to excite an appreciation for certain imagery (paths diverting in woods, roads less traveled, etc. ); the latter, though coming at a moment of budding intellectual confidence, laid waste any idea that I could ever understand poetry written by adults for adults (WTF does ANY poem by Elizabeth Bishop mean!? [seriously]). And so, save for enjoying the occasional Shakespeare play or bit of rhyme, poetry and I have largely steered clear of one another since English XXXX, my freshman(?) year in college. Recently though, I've found myself lurking in the poetry sections of used bookstores, stealing glances at Dickenson, Auden, or Stevens anthologies (so many blackbirds! ), and beginning to realize I've been missing out on something. How, then, to begin filling my gap (in defiance of that college poetry professor who told me -- possibly in more, and more florid, words -- that I had no friggin' idea what Elizabeth Bishop poems mean [flaming lantern balloons rising in the skies over Sao Paolo, or something to that effect, being the specific sense-straw that broke my student-interpreter's back]). Well. How better to start anew down the path of barbaric yawps, iambic pentameters, and broken rhymes, than in the company of someone who has thought long and hard about all the above. I don't have time (or the opportunity that I'm aware) to sit in on a poetry class. The next best thing, I now appreciate, is to read such classes distilled in book form. Making Your Own Days met my own needs for a start-up read in this area perfectly. Kenneth Koch is an astute reader of poetry and a skillful guide to its endless subtleties. I have just finished his terrific long essay on poetry reading/writing/appreciation, and am about to turn to the lengthy anthology that forms the second half of his book. Hitherto, I might have read one of these poems, thought "that makes no sense at all," looked around to affirm that other imagined readers thought the same, then, dismissing the entire poetic enterprise, shut the book (+/- harumphing), and picked a history off my bookshelf. Armed with Koch's wise advice, this time round I'm confident I'll not only read his entire anthology through, but that I'll enjoy large swaths of it and -- perhaps -- grasp a poetic intent or two along the way. The title of Koch’s book comes from 2 lines in Frank O’Hara’s poem, “A True Account of Talking to the Sun at Fire Island”. The book contains three sections; the first is a series of essays on the language of poetry, with essays on subjects such as meter, rhyme, contrast, and personification. Koch believes that poetry is a “separate language”, and he states that the sound of the words is as important as the meaning. The second part is a series of essays on writing and reading poetry. Koch talks a The title of Koch’s book comes from 2 lines in Frank O’Hara’s poem, “A True Account of Talking to the Sun at Fire Island”. The book contains three sections; the first is a series of essays on the language of poetry, with essays on subjects such as meter, rhyme, contrast, and personification. Koch believes that poetry is a “separate language”, and he states that the sound of the words is as important as the meaning. The second part is a series of essays on writing and reading poetry. Koch talks about inspiration, acknowledging that reading the poetry of others often inspires poets. The chapter on writing was my favorite. It delves into the many twists and turns a line may lead the poet on as the poem develops. He addresses places where a poet may become stuck. Koch talks about writing the ending, suggesting that the end may be more important to the poet than to the reader. The final section is an anthology of poems with brief explanations. Most of the poems used as examples are classics, so readers who prefer more modern writing may find the explanations tedious. This was a very dense, difficult read for me. It helped me understand why some people enjoy modern poetry, and why certain conventions are in use, or were important developments at the time, but I'm also almost certain that it also cemented my dislike of all modern poetry. I'm going to stick to light verse and poetry for kids from here on out! I enjoyed the first half of this book, and it's a great resource for teaching beginning poetry (particularly "The Two Languages" and the explanations of rhythm and meter). However, the anthology section is clearly biased toward the basic Western canon (for example, only 13 of the 65 poets in the anthology section, by my count, are women), so I don't find it particularly useful as a resource. I've always wanted to enjoy poetry more, and this was suggested to me by a friend. I have very little experience with poetry, but I found it a great introduction. Perhaps the best thing is that it introduces aspects of reading poetry then the second half of the book is an anthology of dozens of poems with a short note on each explaining and illustrating the things mentioned in the first half. For me, that was very helpful and gave me a chance to put to practice reading poetry and enjoying it. Decent enough introduction. Not as comprehensive as I hoped, but the anthology is well selected. A while back JM wrote about five books that changed her, inspired by a post here. 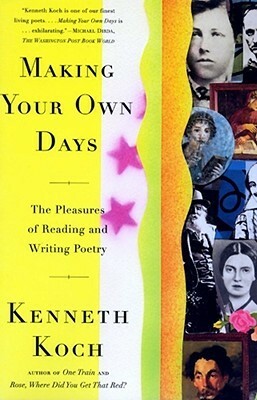 I revisited Kenneth Koch's Making Your Own Days and would classify this as a book that changed me. It made me realize(? ), recognize(? ), remember(?) that I love poetry. I read first two parts of the book as coursework in college. Koch takes Paul Valéry's idea that poetry is a "language within a language" and runs with it. Poetry is a language in which the sound of words is as important as their meaning, as important as syntax. It is a language where the music of words is important. It's a language inclined to comparison, where people talk to the moon and winds and Death, it's a language where people are encouraged to lie. Um, awesome. The first part of the book deals with "the language of poetry," and I think this is the strongest section. It seems like a better introduction to poetry than any textbook that tried to tackle the subject in high school. Later, Koch shoots down the "Hidden Meaning assumption, which directs one to more or less ignore the surface of the poem in a quest for some elusive and momentous significance that the poet has buried." You can enjoy a poem because the language is beautiful. That was an important lesson. In school they always focus on what it all means and how many syllables there are and what the rhyme scheme is. No wonder we get turned off. For me, the weakest link was the chapter on inspiration in Part II on writing and reading poetry. The conversation is vague. I feel like other books on writing cover the subject better. The third part of the book is an anthology of poems. The book introduced me to Frank O'Hara. (In fact, the title of the book comes from "A True Account of Talking to the Sun at Fire Island.") I couldn't help falling in love with him. This time around, I was attracted to Wallace Stevens' "Thirteen Ways of Looking at a Blackbird." The book was a jumping off point. It introduced writers I'd like to read, it made me think it's okay to respond to poems in the same way I respond to paintings or other art: I can enjoy it for its own beauty, even if I don't "get" it. I read this for a course taught by the author that, of course, closely followed the book. That course has had such an influence on me over the years and I recently decided to give the book a re-read. I think this would be a good book for people who have never liked poetry but maybe wish they could. I have enjoyed it for thinking about life in general in more poetic terms and for helping with writing my own. It seeks to lay out for you what it is like to be in the head of a poet writing a poem, w I read this for a course taught by the author that, of course, closely followed the book. That course has had such an influence on me over the years and I recently decided to give the book a re-read. I think this would be a good book for people who have never liked poetry but maybe wish they could. I have enjoyed it for thinking about life in general in more poetic terms and for helping with writing my own. It seeks to lay out for you what it is like to be in the head of a poet writing a poem, which is more than a form of writing but is a different language, one that we perhaps need more of in our lives, something a bit more irrational and magical. I like Kenneth Koch. And he makes me want to read more poetry. Also: this book is pure gold for teaching undergraduates about writing poems. Big ideas stated clearly and with a sense of humor. I've never been so excited to read sections of Wordsworth! (By the way, I wish that was my last name. Peter Wordsworth. That's who I want to be). Koch talks a little too much here, kind of obscuring the power of what he's saying by going on about rhyme schemes and Dante, but he has tons of good solid ideas, so I'll just excerpt him and forget about hard feelings. I read the library copy but I'll probably buy my own. Kenneth Koch has been a long-time favorite of mine in the poetry teaching department - I love the attention he pays to the music of poetry, as well as his erudition, his intelligence and his straightforward style. A treasure reference book. Probably the best (definitely the clearest) introduction to reading poetry that I've read (and I've read a few). I'd recommend it to the uninitiated or inexperienced reader or would-be writer of poetry. Koch's accompanying anthology of poems (with commentary on each one) is a delight. Seeing as poets are the priests of the invisible, their houses of worship are too. But Koch pours a bit sweet bag of critical sugar on top of it so we non-poets can at least see the outlines. Kenneth Koch is most often recognized as one of the four most prominent poets of the 1950s-1960s poetic movement "the New York School of Poetry" along with Frank O'Hara, John Ashbery and James Schuyler. The New York School adopted the avant-garde movement in a style often called the "new" avant-garde, drawing on Abstract Expressionism, French surrealism and stream-of-consciousness writing in the a Kenneth Koch is most often recognized as one of the four most prominent poets of the 1950s-1960s poetic movement "the New York School of Poetry" along with Frank O'Hara, John Ashbery and James Schuyler. The New York School adopted the avant-garde movement in a style often called the "new" avant-garde, drawing on Abstract Expressionism, French surrealism and stream-of-consciousness writing in the attempt to create a fresh genre free from cliché. In his anthology The New York Poets, Mark Ford writes, "In their reaction against the serious, ironic, ostentatiously well-made lyric that dominated the post-war poetry scene, they turned to the work of an eclectic range of literary iconoclasts, eccentrics and experimenters."